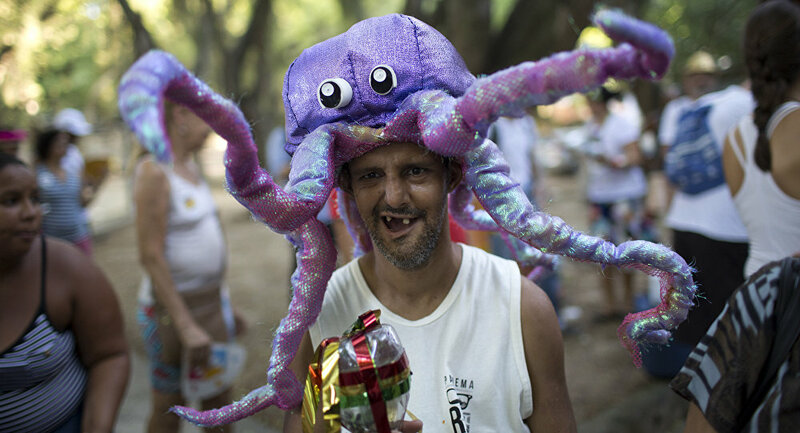 1,500 patients, staff and relatives of a Rio de Janeiro mental institute dressed in different costumes and staged their own version of the country's most celebrated festival. Dozens of neighbors from the neighborhood of Engenho de Dentro joined the carnival, which is close to the stadium used in the 2016 Olympics. "Carnival is part of my life. Our 'bloco' shows that we must overcome prejudice. Crazy people are also capable of being happy and having fun," Andre Poesia, a patient of the institute said. "It is great to be among friends rather than shut inside," Goncalves, another patient, said. The tradition of holding carnivals for patients dates back to 2001 when the staff of the institute changed an art-therapy into a "bloco," the name for the street gatherings that take place all over Rio during the carnival period. "The goal was to get patients involved and to help the neighborhood revitalize its carnival, since the 'blocos' have all gone to the tourist zones," said Ariadne de Moura Mendes, who launched the project. The mental institution has also changed its name to Da Silveira, in honor of one of the most famous psychiatrists in Brazil. Da Silveira radically changed mental health practices in the country; she scrapped violent treatments like lobotomy and focused on reintroducing patients back to society.